The place was brand new so it was very clean and nice. Great hospitality, hosts were only a phone call away and made everything simple and easy!! The location is great as well, very close to the beautiful Agiofylli Beach!! The apartment was new and very well kept. Would definitely recommend to anyone and would stay there again!! I was there between 16 of Sep and 20 of Sep. The rooms are very well cleaned and in good condition. The building is new and very well furnished and equipped with every appliances that you need, very comfortable and cosy! Good location with a possibility to park your car outside on site or at the street! And finally, but not at the last place, the hosts were very friendly and kind people, ready to help you with what they can and at every moment. I am glad that I was there and I will go back for sure! Thank you for the nice time that I spent there! This property is great! In the appartment is everything you need. It is very clean. The bed and the sofa are comfortable. Hosts thought about everything, they are very friendly and always there to help you. I was surprised when we came because I didn't expect that the accommodation will be this good! The owner is one of the most kind and friendly hosts I have ever met. He is willing to help with whatever request you have. The apartment I stayed in was very clean, had all the necessary facilities, the Internet connection was excellent. There was enough space in front of the building for parking. Really close to the port. I definitely recommend Kavadias apartments. Big space for an apartment even if it had only one bathroom, well equiped, clean, friendly staff, good position. Thank you! Everyday cleaning. Towels changed every 2 days. Big balcony. All the utilities included. Staff is friendly and helpful. Brand new, very well equipped, spacey apartment. Very nice, helpful hosts. Very good location, near the port, restaurants and shops. Big parking space in front of the building. The host came to show us the exact location of the hotel by hisself and was very nice. The location was perfect - just next to the main trading street. The coastal alley was on a 5 minute walk. The hotel is new and everything looks good. Lock in a great price for Kavadias Apartments – rated 9.6 by recent guests! One of our best sellers in Vasiliki! Set in Vasilikí in the Ionian Islands Region, 1,300 feet from Vasiliki Port, Kavadias Apartments features a barbecue and views of the mountain. Agiofili Beach is 1.6 mi away. Free WiFi is available throughout the property. The accommodations features a flat-screen TV. 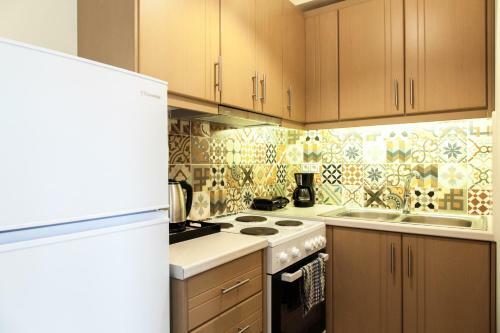 There is also a kitchen, equipped with an oven. A fridge is also provided, as well as a coffee machine and a kettle. Every unit is equipped with a private bathroom with a hairdryer. Bed linen is featured. Porto Katsiki is 9.3 mi from Kavadias Apartments. Aktion Airport is 22 mi from the property. 뀐 Located in the top-rated area in Vasiliki, this property has an excellent location score of 9.2! 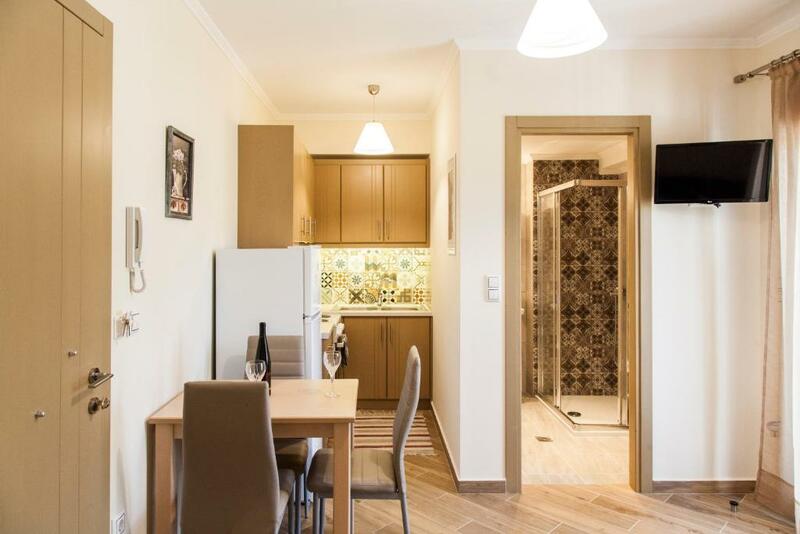 When would you like to stay at Kavadias Apartments? This apartment has a kitchen, tile/marble floor and kitchenware. welcome to Kavadias Apartments in vasiliki,Lefkas. Our apartments are located near the center of Vasiliki village and very close to the beautiful beach of agiofili and to the beach of ponti,one of the most famous beaches in the world for wind surfing. 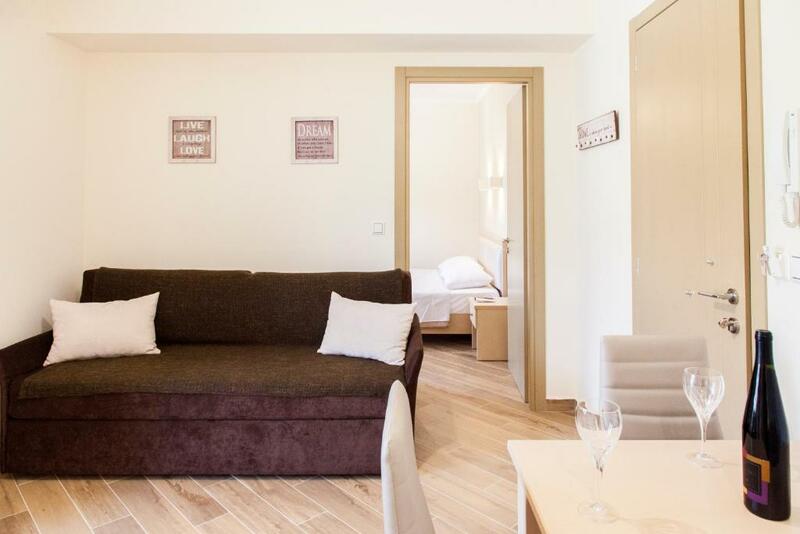 All our apartments are brand new with a fully equipped kitchen, a bedroom,a living room and a cabin bathroom. Next to our property there is a free parking area. We will be glad to accommodate you and make your holidays unforgettable ! Hello,we are Katerina and Thomas Kavadias ,the owners of "Kavadias apartments" and we will be happy to welcome you in our apartments . Close to everything ,like restaurants , cafe , super markets etc . Next to a free parking area . House Rules Kavadias Apartments takes special requests – add in the next step! Kavadias Apartments accepts these cards and reserves the right to temporarily hold an amount prior to arrival. Please inform Kavadias Apartments of your expected arrival time in advance. You can use the Special Requests box when booking, or contact the property directly using the contact details in your confirmation. Only one bathroom, blocked an ammount of money before arrival. Unable to see the sea from the rooms. Area in front of the building requires some maintenance and currently looks a bit messy. Would look 100% better with some more tries/flowers. There was no shampoo and shower gel, just a liquid soap by the soak. We were staing for 3 nights. They cleaned the rooms every day, but just the floor and the garbage. Our towels were wet but they never chaged them, although it was raining so we had to use them wet. Our expectations was bigger. Brand new apartment with qualitative equipment. Clean, spacious, with all the necessary facilities and 5 mins from the beach and the restaurants. Super friendly host, cleaning service provided every day, convenient location near Vasiliki port, markets, beach etc, the venue is quite new and everything makes you feel like home. There was a bad smell from the sink in the kitchen, but after we told it to the owner , he fixed the problem directly. Thanks. Close to the center full with restaurants and shops. Nice new building , arranged well and kept clean and nice. The beach is 5-6 min walk far. Very kind owners and stuff. The place is very clean. Everithing is new. The personal is very friendly and helpful. I strongly reccomend this hotel.